Kids naturally possess a magical characteristic so it's fitting they gravitate toward the most whimsical creature of all, the unicorn. Like unicorns, children have a twinkle in their eye and whenever they're cuddled up with their ultra-soft unicorn Critter Blanket, we bet that unmistakable childlike twinkle is most evident. Their sparkling eyes will intensify when you give them this coordinating Unity the Unicorn critter cap to match their beloved blankie. Perfect for wearing to the park and baseball games, this unicorn hat will accent the enchanting spirit kids naturally have. Perfectly matching the matching Unity Unicorn blanket, this hat is a beautiful shade of violet. 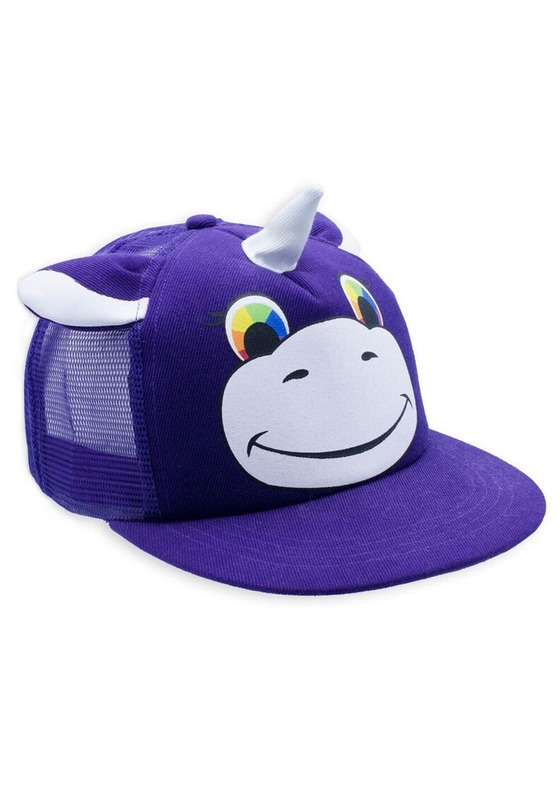 The baseball-style cap has a plastic size-adjustment band in the back so it will still fit your little unicorn-lover as he or she grows up. This Critter Cap features an adorable printed face with rainbow kaleidoscope eyes, soft-sculpted ears, and a plush horn just like the Critter Blanket. Don't be surprised if your little one wants to start a collection of these adorable and popular Critter Caps so they can wear a different one every day of the week. We also see Finn the Fox, Pickle the Pug, Seymour the Shark, and Chloe the Cat Critter Caps.